I Want YOU to Have a Holiday - Planet Aid, Inc.
Summer is a time for holidays spent by the beach or in the mountains. It is also a time that state governments across the country offer consumers a tax holiday. For an entire week or weekend during July or August, 17 states temporarily suspend sales tax to help boost a back-to-school shopping spree and help parents stretch their clothing budget. Every one of the states offering tax breaks include exemptions on clothing, but most of the states limit the exemption to items that cost $100 or less. Retailers count on back-to-school shopping sprees. In fact, the amount of money spent on back-to-school shopping is second only to Christmas. According to the National Retail Federation, this year’s back-to-school spending is predicted to be less than that of last year. So the fight for consumers is on. As you restock your kids' closets with fresh school clothes and shoes, the question becomes what to do with all the old stuff they won’t wear anymore? Some items may be stained, worn thin, or even torn. But that doesn’t mean they should be tossed in the trash. Did you know that of the textiles that are commonly thrown away, 97% are recyclable? Donated items can find new life with a new owner who will treasure them as much as you did when you first purchased them. 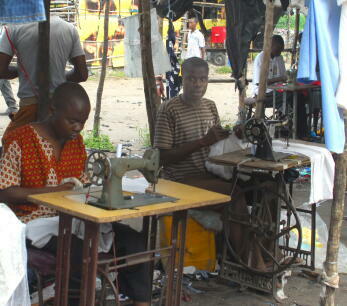 Vendors who sell used clothing at local markets in many parts of the developing world repair the merchandise they sell to their customers, resulting in very little waste. So bag up that unwanted pile of clothes and donate them today. And remember, if you choose to recycle your clothing and shoes with Planet Aid, they will yield much more than environmental benefits. You will also be helping support development projects for those who need it most. To make it easier for you to donate, Planet Aid has more than 18,000 convenient donation bins in a 21-state area. Find a bin near you.